As Book Blogger Appreciation Week draws near, I think we are all reflecting on how much the book blogging community means to us. Bestowing awards is just a part of the generosity and kindness found among bloggers. 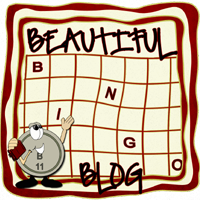 Bingo Blog Award: This award is generally given to five blogs at a time for the following qualities: B = Beautiful, I = informative, N = neighborly, G = gorgeous, and O = outstanding. Carolyn from Book Chick City gave me this award for Neighborly. And Elena from With Extra Pulp gave me this award for Outstanding. Humane Award: "This award is to honor bloggers that are kindhearted individuals. They regularly take part in my blog and always leave the sweetest comments. If it wasn't for them, my site would just be an ordinary book review blog. Their blogs are also amazing and are tastefully done on a daily basis. I thank them and look forward to our growing friendship through the blog world." Thanks to Velvet from vvb32 reads for thinking of me. 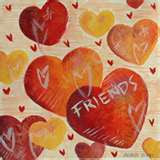 Let's Be Friends Award: "This award is given to bloggers who are exceedingly charming. These kind bloggers aim to find and be friends. They are not interested in self-aggrandizement. Our hope is that when the ribbons of these prizes are cut, even more friendships are propagated. Please give more attention to these writers. Deliver this award to eight bloggers." The generous Velvet from from vvb32 reads kindly gave me this award. Who Loves You Baby Award: J. Kaye from J. Kaye's Blook Blog developed this one: "This award is designed with one purpose in mind. Pass this on to other bloggers who have awarded you in the past." Isn't that a great idea? I will be passing this along soon. Queen of ALLL Things Awe-Summm Award: Serena from Savvy Verse & Wit passed along this super award. It comes with a meme: "Once you receive this award, you have to share 7 Awe-Summm things about yourself and then pass it on to 7 others." I just answered this meme a few weeks ago, so I'm going to rest on my laurels. Thanks so much to all of you for thinking of me. When I started blogging last fall, I had no idea that the people in the book blogging community were so incredibly awesome. As always, I encourage you to visit the blogs linked here. These book bloggers are some of the best, and you shouldn't miss their posts. Wow! You deserve every one of those awards. Congratulations! My goodness. And: Well deserved! Congratulations - They are all well deserved. Holy cow girl. You are rolling in them, and with good reason. You are a highlight of the day for all of us! Congrats on the awards, Beth! They're all well-deserved! Congrats on all those awards.